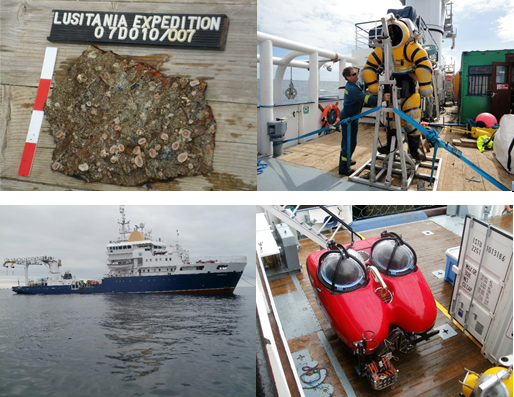 Teams from the US, Canada, UK and Ireland recently conducted an exploration into the famous ships sinking. The dive was in aid of a new two hour documentary, to be broadcast by National Geographic in the US. The documentary, entitled ‘The Dark Secret of the Lusitania’, will attempt to uncover the mystery surrounding the sinking of the Cunard Liner off the Southwest coast of Ireland in May 1915. The documentary is being co-produced by Aidan Mulcahy (From Here to Maternity) of Cork based production company M3 with Dave Harding (Cave of Forgotten Dreams) executive producing. Niall Mahoney of Musketeer Production Services in Cork has been providing production support for the project. The Commissioners of Irish Lights vessel ILV Granuaile was chartered by Lusitania Productions Ltd. to support the project. The Cunard liner was hit by a single torpedo fired from a U-boat while off the Cork coast on May 7 1915, but it has never been established why it sank so quickly after being hit.